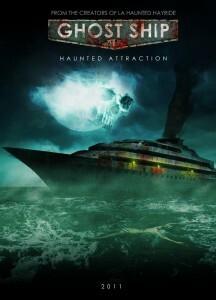 Ghost Ship to Set Sail, Dare to Climb Aboard? WARNING: Not for the faint of heart. This October, the country’s first haunted attraction that sets sail into the vast ocean at night, makes its maiden voyage. From the creators of Los Angeles Haunted Hayride, Ghost Ship has three floors of sheer terror. Guests will be brought through the abandoned hallways in the gut of the ship, which was once the treatment deck for those who received Electro Shock Therapy, Hydrotherapy, and Sleep Disorder Rehabilitation. Old examination rooms and the morgue are also located on this floor. On the middle floor, passengers can sip on a cocktail and explore the 1930’s ballroom. However, do not think of this as a moment of reprieve. Finally, the top deck will feature an interactive execution experience. Celebrate Halloween in a way that has never been done before. Before purchasing tickets, take heed of the safety information.